Psoriasis is a common chronic and recurrent skin disorder characterised by dry well circumscribed, silvery scales or plaques which usually appear over the scalp, elbows, knees, back or skin folds but it may affect any or all parts of the skin. 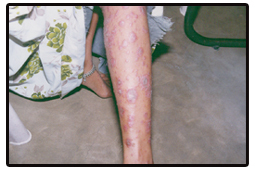 Psoriasis observed as an inherited disorder in few cases; autoimmune disorder in many cases. Since the other systems of medicines fail to treat the root cause recurrence is very common. 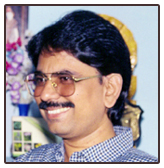 Homoeopathic approach of any case is to treat the patient as a whole individually and not the disease. That is the reason why Homoeopathic medicines treat even the so called incurable diseases and doing wonder in the field of medicine. 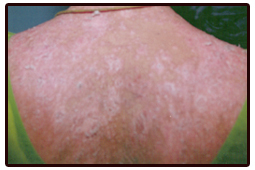 Here I represent a very severe case of Psoriasis, which was treated by eminent skin specialists, until she came to me for consultation. The patient was a young lady of 20 years old, fair and lean came with her husband since she had patches of thick scales all over the body, limbs and scalp with cracks and she was unable to flex the limbs fully. She was totally dejected and vexed about her complaints. Even after strong Allopathic medicines she had only limited improvement. She was suffering from this awkward and dreadful condition for the past 3 years. 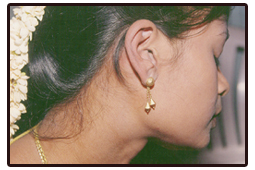 It initially appeared over the scalp and then gradually spread to all over the body. The patches were well-defined dry plaques covered with shiny silvery scales. 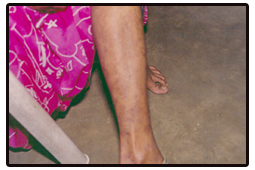 She developed cracks in the patches of forearm and legs. She had intense itching in night, which was ameliorated by hot water bathing. She used to wake up in the midnight due to burning pain in the patches. She had pain in the left knee joint of 6 months duration, which was aggravated by initial movement. She used to get frequent attacks of cold when she was a child. She had a child of 2 years old and her menstrual history was normal. She preferred hot food and hot drinks. She was irritable and short tempered. History of suicidal attempts twice when there was severe aggravation of her skin complaints. After going through the case history the patient was treated with the following prescriptions, which proved the efficacy of our dynamic medicines, when it is applied appropriately on the basic of individualization. My first prescription was Arsenicum Album 30 - one dose daily for 3 days on 1-04-1999. Till date no recurrence of complaint. The photographs, which were taken during the course of treatment, are displayed at back wrapper.